Amazing news! 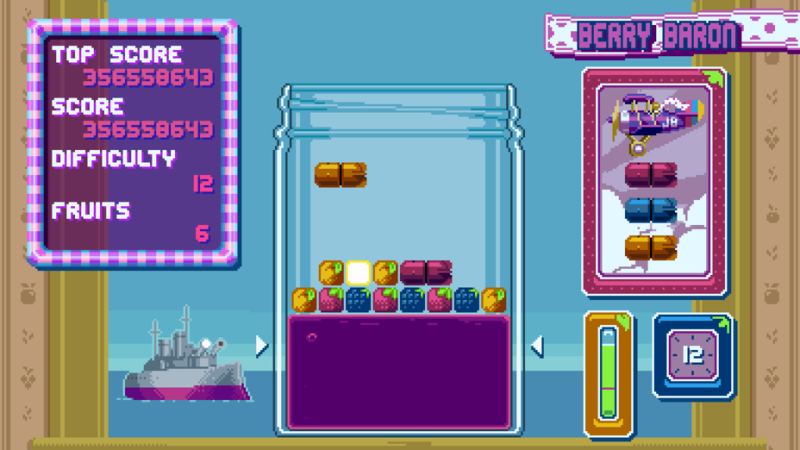 Dinofarm Games’ third official game (we’re not counting our 24-hour game, Sheepshifter), Jelly Bomber, has been released on Steam. All the beautiful art you’re seeing is by Blake Reynolds (he’s also working on the title screen music!). All the programming was done by Nicholas Maddelena. I did the game design, sounds/music, and a bunch of other stuff. We got Jelly Bomber to where it is in just about one year. We came up with the idea for the game at the last Play NYC. While we think Auro is a fantastic game, we wanted to make something that people could immediately pick up and start playing without learning a bunch of rules, like at a convention. I think it’s probably a pretty good middle ground, where you can sort of play without knowing all the special rules (like what strawberries do when you pop ’em), but there’s a lot of strategy space to explore once you do learn all the rules. It’s currently in early access. There’s a lot of stuff we still want to do for the game. Maybe you can weigh in and let us know what you’d like to see more of in it first. More characters? More story content? More art/animation/polish? Multiplayer or other modes? Let us know! Thank you so much to our Patreon Patrons who helped make this happen! There’s a launch sale of 15% off, so go grab it now!